Only some of this is true anymore. 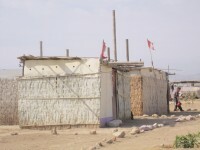 ACORN Peru’s head organizer, Orfa Camacho, estimates the population may only be 20,000 now since the 2007 earthquake devastated so much of this town, that too many have forgotten. We spent most of our time going through the newly built barrios that had sprung up by the hardest hit areas in the last 5 years. These were patchwork enterprises of thatch, plywood, and whatever. There were signs everywhere of people trying to grow banana plants, trees, and flowers. The committee told of a government program that was supposed to help in the rebuilding called Mi Techo Propio or My Own Roof. Problem was that to access the program you had to put down 1000 soles or $400 roughly. You also had to pay 20% interest and have a “formal” job which almost no one has anymore. Worthless. We were standing in the community center or what was supposed to be the community center some day. The money had come from Venezuela, but someone messed up somehow and it was unfinished. We heard about the issues of water where people were paying a fixed rate and could access water for only an hour or two per day and as more people came on there was less water. There were industrial pig and chicken growing operations operating “informally” right in the barrio. People would complain. They would get a pig. Most of the women were single mothers running households, but most of the governing councils making the priorities were all men. 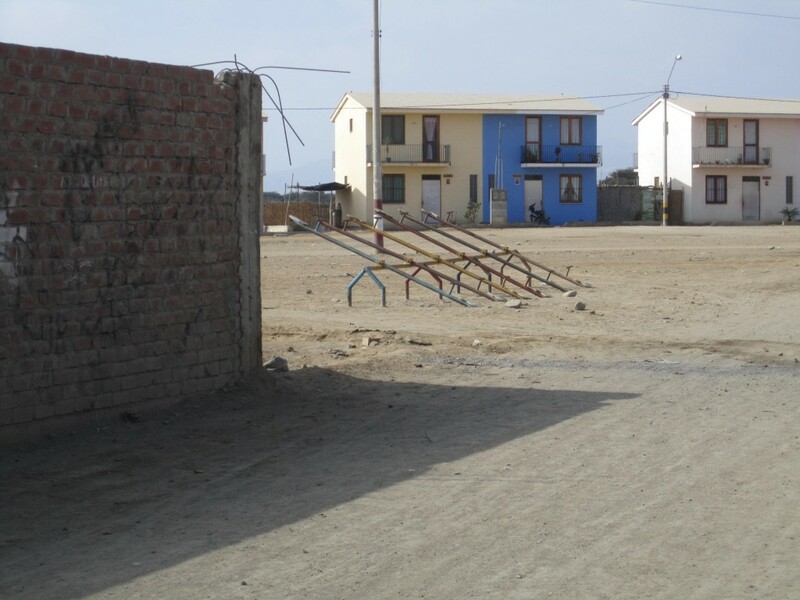 Two story houses had been financed by Spain behind the unfinished plaza and the unfinished community center, but it was unclear if water connections had been provided. ACORN Peru will have their work cut out for them here.